A sparkling work of literary interpretation by a gifted and versatile author. In sheer brilliance of thought and expression and in range of selection of material few writers can excel Dorothy Sayers. Whether turning to mysteries, devotional literature, to mysticism, drama or history. Miss Sayers produces interesting and engaging results. The material here presented was originally delivered as a series of lectures at Cambridge. She makes Dante come alive for the modern reader. As is too often true of the classics, Dante is more often quoted than read. 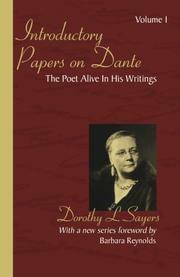 Dr. Sayers would rescue Dante from the clutches of scholars, in firm conviction that he wrote for the common man and woman. She would tear away the veil of mystery with which Dante has been surrounded by frankly stating that the Pivine Comedy is an allegory to be interpreted on four levels:- literary, political, moral and mystical and that the allegory is concerned chiefly with this life and not exclusively with life after death. She expands a four-fold interpretation of the Comedy, its paradoxes and its comedy..... Too bad the typography is not better.